Team players at King Nation Basketball are used to hard work, thanks to Coach Vidal Massiah. “[King Nation Basketball] is a platform for young boys and girls who want to pursue basketball at the post-secondary level, to have an entry point into the game,” Massiah explains. After receiving a scholarship at St. Bonaventure University in New York State, Massiah graduated with a degree in Marketing and began playing professionally throughout Europe and Asia. Since then, he had the honour of holding the title of captain of the Canadian Men’s National Basketball team. Massiah says a lot of the youth that come through the doors don’t know their potential as players, so it’s his responsibility to guide them to the best of their ability. “They don’t really have the true sense of how good they could be, so it’s kind of our job as coaches to, again, help direct it, mold it, nurture it and at times, help push and pull it out of them,” he says. King Nation is partnered with Drive for Dreams, an organization that generates funding to support youth who lack access to high-level training and helps provide them with the experience of achieving excellence through basketball. 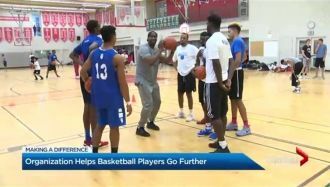 “We provide them with the tools in order to get in front of coaches so that they can get the exposure to be offered a scholarship,” says Michael Simonetta, founder of the Drive for Dreams Foundation. Without King Nation and basketball, some players wouldn’t be granted the opportunities they’ve received. “Basketball has given me structure. It’s helped me a lot,” says Eza Dike-Nwagbara, player at King Nation basketball. Massiah believes that if they can help kids achieve their goals, they’re making an impact. 5 Year Hoop Factory Trainnes earn scholarship!